Residents of Columbus who are seeking addiction treatment for themselves or their loved ones can choose to go for private rehab in Columbus Ohio or any government-sponsored rehabilitation program in the area. I just overheard an ABC News report on teenage binge drinking. Seems today's young people, far from being apathetic, are very, very concerned about drugs and alcohol abuse. They truly care...that there isn't enough of it. So America's youth have all kinds of tricks, websites and YouTube instructions for getting good and truly bombed, s-faced, smashed, baked, blasted, bent, high, wasted, blotto, gassed, jazzed, goofed, Hollywood-celebritied, Project X'ed, (okay, I'm just making terms up now. Bet they exist, though). 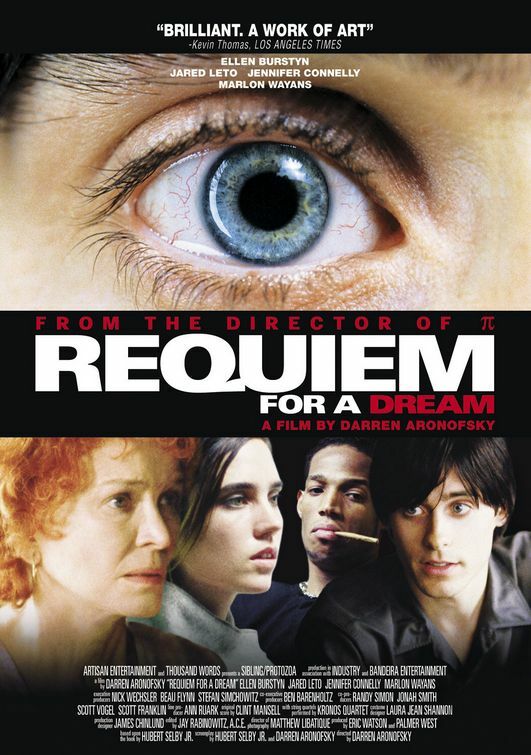 In this cynical mindset, then, I have to ask: with the CWRU Film Society reviving Darren Aronofsky's addiction classic REQUIEM FOR A DREAM, is it to serve a warning...or to give campus newcomers some useful how-to partying pointers? Especially with fall Halloween Riots season upon us. In the Coney Island neighborhood of New York City, four interrelated characters succumb to chemical addiction over a year. Harry (Jared Leto) and Marion (Jennifer Connelly) are childhood sweethearts, he from the lower classes, she from a rich family. But both are addicted to smack. Harry supports Marion's career goal to open a designer-dress emporium and tries with his friend and fellow addict Tyrone (Marlon Wayans, best known for comedy roles, in a serious outing) to peddle drugs to finance the venture. Most tragic of all the quartet, arguably, is Harry's middle-aged mother Sarah (Ellen Burstyn), obsessed with shedding weight to appear slim and pretty for her pathetically lumpen lower-class hausfrau fantasy of going on a TV game show. Prescribed amphetamines by a faceless, impersonal medical establishment, she drifts into mindless oblivion herself, and it's all perfectly legal. 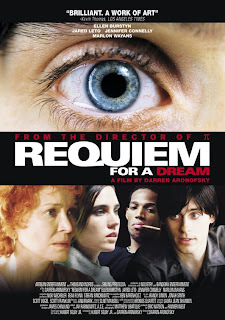 Skillful, surreal camerawork (that won the director comparisons to Stanley Kubrick) and sympathetic characters - none of them want to be Scarface, they just want to be happy - make REQUIEM FOR A DREAM more than just the proverbial "classroom scare film." Or does it? I must come clean and say that as a lifelong straight-edge and non-drinker (in other words, a freak and outcast) I had sort of banked on the idea that remaining stone-sober would have paid off for me in the long run. As all my peers theoretically would wind up like the characters in REQUIEM FOR A DREAM, I would stand tall as just about the only employable person for miles in what passes for a job market in Ohio.Yet, that scheme failed miserably. Nobody wants to hire boring old me. Deep down inside I suspect a lot of companies and HR recruiters are instead keenly on the lookout for applicants on the level of Marion: "Chick is crazy! She'll do anything, man! And she looks like that smokin' hot Jennifer Connelly, too!"